Many individuals are now beginning to prepare themselves for an emergency that could take place at any time. Planning for so many contingencies can be exhausting but it is certainly an essential thing to consider. Considering what items to put in your emergency supplies and take with you if you have to leave your home is truly one of the most important things to deal when planning for emergency preparation. An emergency might mean that you have to leave your home and sacrifice the belongings that mean the most to you in favor of the items that will help you survive in this time of crisis. 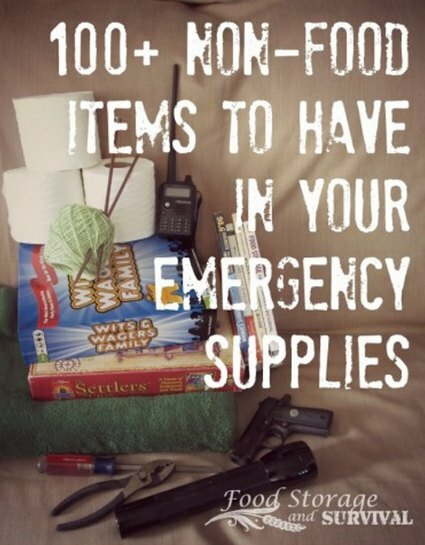 While food items are a critical concern, the additional items you’ll need to add to your emergency supplies is equally important? With this purpose in mind, we’ve found an outstanding guide that will provide you with an informative and comprehensive list of necessary documents and items that you will need to add to your emergency supplies and presents them in a way that is easy to remember. The list is separated into many topics that address different issues and help to create a detailed idea of what can be stored to get you through a crisis. Important topics include medical supplies, sanitation, personal hygiene, communication, hand tools, and pet supplies, among many other subjects. The list also includes important items that you may need if forced to travel including personal ID, and ID that you would need to carry out different tasks (e.g., driving a vehicle, or leaving the country). This list is both informative and beneficial and will bring peace of mind to anyone who may feel overwhelmed with the idea of preparing for emergencies. It is also an excellent resource for anyone who would like to take their emergency kit to the next level and educate themselves about the items that would be the most beneficial in the event of an emergency.